RLI meets all the Reasonable Value criteria, with room to spare. RLI Corp. underwrites property and casualty insurance primarily in the United States. The company serves the commercial market almost exclusively and operates in three segments: Casualty, Property, and Surety. RLI insures things like office buildings, factories, apartment buildings, refineries, truckers and more. A measure of profitability used by insurance companies to indicate how well they are performing in daily operations is the Combined Ratio. A ratio below 100% indicates that the company is making underwriting profit while a ratio above 100% means that it is paying out more money in claims than it is receiving from premiums. For RLI, combined ratio for the quarter improved 480 basis points year over year to 74.7% driven by an improvement in Casualty and Surety combined ratios, partially offset by decline in the Property combined ratio. Because the growth picture is somewhat murky with the Casualty segment lagging in underwriting and the Property segment's combined ratio failing to improve, Zacks maintains a Neutral rating on the stock. Similarly, Stifel Nicholaus has upgraded the stock but only from SELL to HOLD. 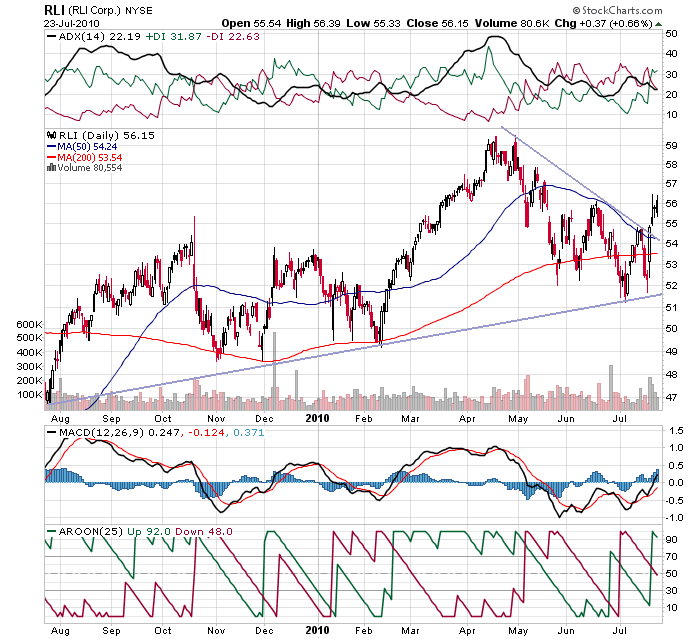 RLI is a value stock with a growth stock chart. Caveats are that it is not unusual for financial stocks to pass the Reasonable Value screen and the company is seeing uneven results in two of the three segments in which it operates. On the other hand, the company is solidly profitable, raises its dividend on a regular basis and has been able to reduce costs year over year. 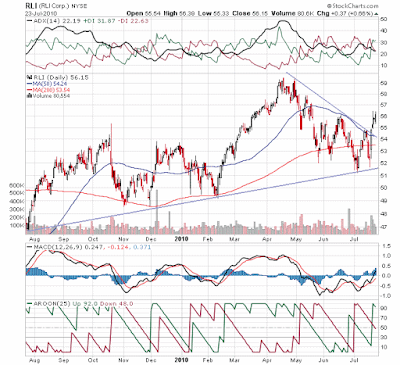 I'm not an expert in analyzing insurance companies but the stock could be worth a trade.